St Albert the Great was born the son of a Count in Lauingen, Germany. He was well educated and studied at the University of Padua. Inspired by the Blessed Virgin Mary, but against the wishes of his family, he joined the Dominican Order and was ordained a Priest. While a Priest, St Albert continued his studies in Theology and lectured at the University of Cologne where he became Master of Theology. He then taught Theology at the University of Paris as Professor and held the seat of Chair of Theology. 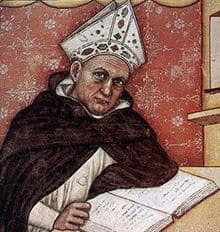 St Albert’s writings are extensive, running to 38 volumes and covering a wide range of subjects, from the sciences to law, friendship and love. St Albert’s Feast Day is the 15th November. He is Patron Saint of Scientists and a Doctor of the Church, one of only thirty-five. Pray for us that we will use our skills wisely for the spreading and celebration of our faith with others.